Hi! Richard Elfman here. And that devil in the picture is my brother Danny Elfman. creations by my musically gifted brother. The shows were fun, fast-paced and outrageous, laced with dance and comedy. About ten years ago, after putting up my first website, I got many thousands of hits from Forbidden Zone fans all around the world. Now, every few months, I’m flown to a different city to address screenings full of young fans, many of whom seem to know every line. Not long ago a top company even offered to colorize the film, a costly process—something that I had always wanted to do. But why the success and longevity of this micro-budget, quirky little movie? It’s weird, yes, but there are deeper reasons for the length of its legs. First of all, it’s funny—perhaps described as; absurdity laced with bits of comedic pathos. 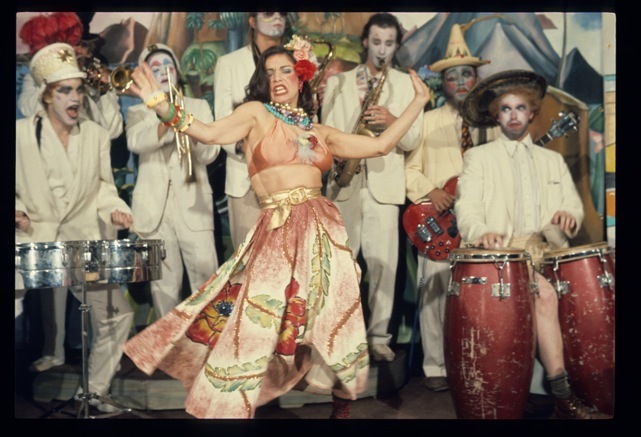 But ultimately, it’s that Forbidden Zone, like the Mystic Knights of the Oingo Boingo, has timeless, MEMORABLE MUSIC, as opposed to simply SERVICEABLE MUSIC. What I’m about to say may piss some people off, but Chicago is a good example of serviceable music. I personally loved both the play and the film, but after the show, the tunes seemed to mush together in my head. Other than a catchy line or two (all that jazz…), the melodies just weren’t that “take for life” memorable. But they worked fine along with everything else—to service the vehicle. Memorable music stands on it’s own, without the visuals. Time only burnishes it. I’m talking; Wizard of Oz, West Side Story, Fiddler on the Roof, even O’ Brother Where Art Thou, which deftly mined forgotten folk music, buried in plain sight. as well as the stars, dancers and designers. And I guarantee you something bigger, badder, bolderand even more damned fun than the original— FORBIDDEN ZONE 2!